European-style (wall unit) A/C in the 3 bedrooms. Updates and relocated outdoor shower and a entertainment room in the basement. Enjoy a beautiful sunset right from the deck of this upside down house. This 3 bedroom house has great water views and is just 100 yards to a private association beach or a quick drive around the corner to Campground Beach. The first floor has 3 bedrooms with queen beds and a full bath--there’s also an outdoor shower. The upstairs is an open floor plan with wrap around windows, the kitchen, dining and living areas, 1/2 bath, and deck. House features hardwood floors, new beds and mattresses, new indoor and outdoor furniture, LCD TVs, and WIFI access. Great beach for exploring for the little ones during the day and incredible sunsets at nights for the adults to enjoy. Amazing house and spectacular views. Sunsets every night and close to everything. We go back year after year. As a multi-year renter (fourth summer coming up), we love staying here. The location to the water and the views of the Bay from the deck and inside the house (upside down design) are fantastic. Everything is as described - three bedrooms with excellent AC (great for those nights it doesn't cool down as much), big living area upstairs, very clean, kitchen well equipped, and a full basement with ping pong/pool table. We've rented many houses in Orleans and Eastham over the years, but this one we keep coming back to - and one of the few we've enjoyed staying in for dinner vs. going out to dinner! Owners are great to work with too! I thought twice about putting in a glowing review because I want to make sure the house is available again next year!!! Our group of 4 adults and 4 1/2 children had a fantastic & very comfortable stay, with great weather at an ideal location. We've stayed on Campground Beach before and several other towns on the Cape. Eastham is our favorite and this house is now my favorite too! The deck is definitely the place to be at sunset every night and every morning with your coffee. You can enjoy the ocean views from the deck as well. Hardly a 2 minute walk (you're the 3rd house back from the beach) gets you to your own private beach where you can walk for miles during low tide and jump right in the ocean at high tide. We enjoyed beautiful sunset swims a few times:) There's so much to do in Eastham and the surrounding towns - it is the perfect area for a Cape Cod vacation. The neighborhood this house is located is great for jogging. The bike trail and Oceanside beaches are a must as well. The house itself is everything described and more. The upstairs is very spacious and comfortable with a great open kitchen/dining/living room area. It really is fully-equipped with even more than we had expected. The larger bedroom has a nice flatscreen t.v. and a rollaway cot in the closet. There's plenty of beach chairs, tubes, a couple of bikes, beach toys all in the basement. The kitchen was fully stocked which was so appreciated. The indoor shower hardly got used thanks to the outdoor shower. We loved our dinners around the large dining table with big windows and then late nights out on the deck with cocktails. The kids would take a short bike ride to the convenient store every day for slushies (less than a mile). The homeowner was so great about answering our questions (probably 100 by the time we were done!) and very patient when we THOUGHT we left a wedding set at the house after we returned home! Truly, hanging at the house/beach every day is a great place to be, or take a ride around Wellfleet, Truro, PTown or Orleans, Brewster, Chatham . . . . the possibilities are endless in this ideal location. You will not regret staying here. If you love the beach, salty air and a good location for fun things to do - STAY HERE! 2014 will be the third year that we have rented this house. The house is roomy and the kitchen has everything you need. Location is great and the view of the bay is fantastic. You can sit on the deck with a glass of wine and enjoy beautiful sunsets. A wonderful spot for family dinners and get togethers after a day of exploring the Cape. The owner is great to work with and quickly answers any questions you might have. A 2 minute walk down the road takes you to the beach where at low tide you can walk out a mile exploring the beach and it’s sea life. The house is located close to a bike shop and the bike trail, grocery stores, restaurants, ice cream, coffee and donut shops. A short drive (5-10 min.) from the house and you are on the ocean side at Nauset Light and Coast Guard beaches where you can have campfires on the beach (with a permit from the Visitor’s Center). Cape Cod Baseball league games are in the neighboring towns of Brewster and Orleans, a short drive away. Charter fishing is close by in Wellfleet and Rock Harbor. Make sure you go to Arnold’s (for lobster rolls and clams), Wellfleet, Provincetown and Chatham. While in Chatham make sure you stop by the docks to see the fisherman come in with the catch of the day. We have many memories from our time here. It is a wonderful house with a fantastic view in a great location on the Cape. Can’t beat it! This house is very well maintained and is fully stocked with everything you need for a beach vacation including beach chairs, beach toys and even two adult mountain bikes. The location is great with so many close water options including the calm bay side beach literally around the corner or a short drive to the National Seashore for bigger surf or a beautiful kettle pond. When the tide is out on the bay side you can walk for miles in shallow water and try to catch crabs, which our 6 year old son really enjoyed! When the tide is in, the water is as easy to access as a pool. You just climb down the ladder into a couple of feet of water and after a few strokes you are in water up to your neck but still calm. Some non-water activities include the bike path, drive in movie theater and mini-golf. Just down the road is the National Seashore Museum, which is free, and also has great walking trails which are perfect for younger kids on a non-beach day. We also drove down to Harwich to catch the Nantucket ferry for a day trip. The house is very spacious and had more than enough room for our family of four. The extra touches like the TiVo and washer and dryer were much appreciated. There are many dining options from pizza places to more formal sit down restaurants to great seafood places like Arnold’s and Catch of the Day (we loved the fish tacos!). And of course the sunsets from the porch are incredible. 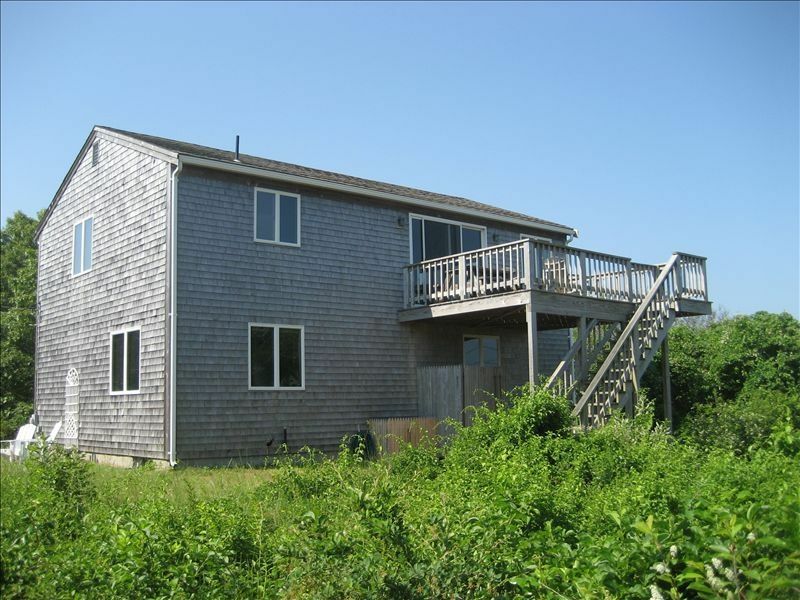 I would highly recommend this house to anyone looking for the perfect Cape Cod vacation! We had a wonderful stay over Easter, we enjoyed the Cape off-season and the house's location makes it super easy to take advantage of everything the Cape has to offer- long walks on the beach (the bay just 2 seconds away, and the ocean a short drive) with almost no one else around, it feels like you have the Cape all to yourself. And we saw whales right from the shore!! The house itself is extremely well-equipped with everything you could possible need, the owners have thought of everything. The beds are very comfortable, and of course the view upstairs is to die for. Unfortunately we only got to see one sunset from the house since it was cloudy all the other evenings, but having breakfast with the bay stretched out before you is the most incredible way to start every day. The way the house is laid out, with the living space upstairs and all the windows, even on cloudy or rainy days you don't feel pent up inside because of the great views. (Our only criticism was that the TV "couch" was not very comfortable). The owners are very nice and were helpful answering all our questions. Excellent rental! Hi- Thanks for the nice review. We too love the Cape in off-season. We are actually bringing down new seat cushions for the TV "couch" this weekend, so we hope that will improve their comfort.